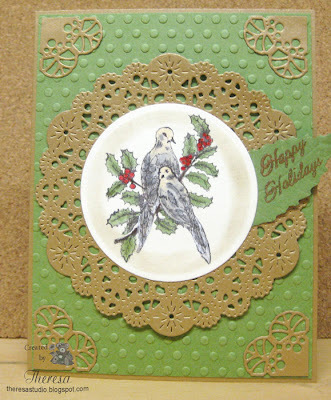 Today's post is another Christmas Card that I am entering for challenges at Flourishes, Cheery Lynn, and more. 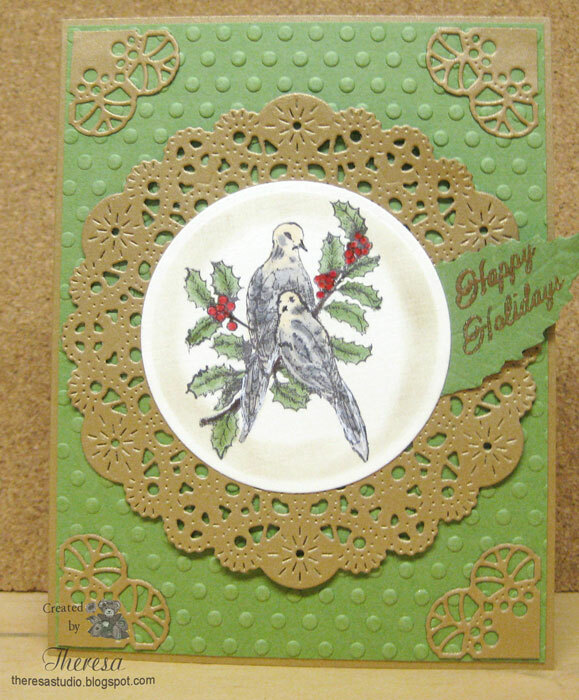 My card began with a base of gold cardstock layered with a mat of embossed green. I stamped the image of Doves on ivory cardstock and colored with Copics and sponged with metallic gold ink while it was in the circle die. I attached this to a die cut doily of the gold with a sentiment stamped and heat embossed on a die cut leaf. I finished by adhering this to the card and added some corners of gold. Flourishes Timeless Tuesday: Create a Christmas in July card (FTTC230), but it has to be SEMI FLAT for mailing. Cheery Lynn Designs: #90 Silver and /or Gold. I used gold for Doilies and have some silver in the doves. 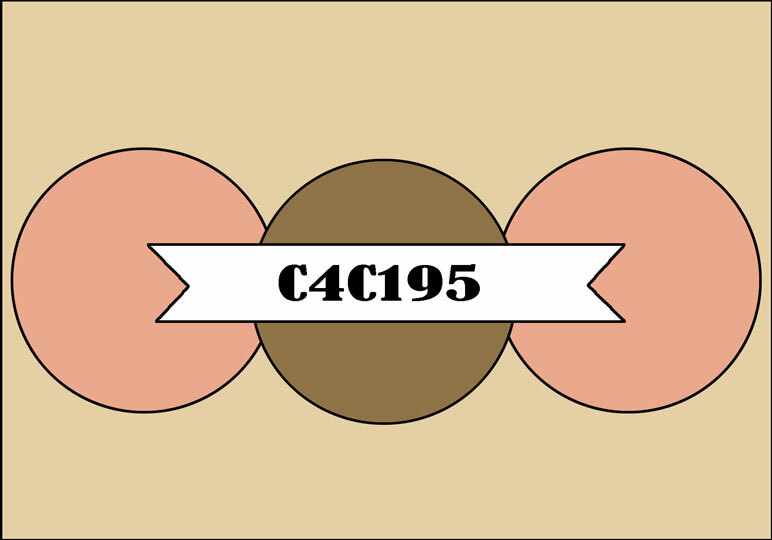 This is a simple CAS Card in black and white. 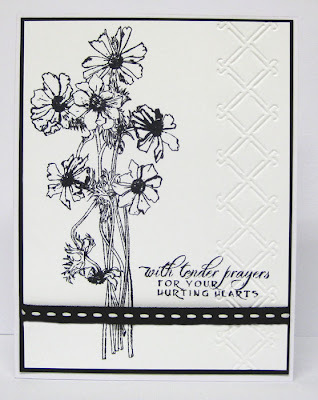 I simply stamped the sentiment from Flourishes Pinwheels and Popsicles 4 times in GKD Black Onyx ink on White CS and embossed the left side of the card with a Darice Embossing folder and divided with a Black and White ribbon from my stash. That's it!! 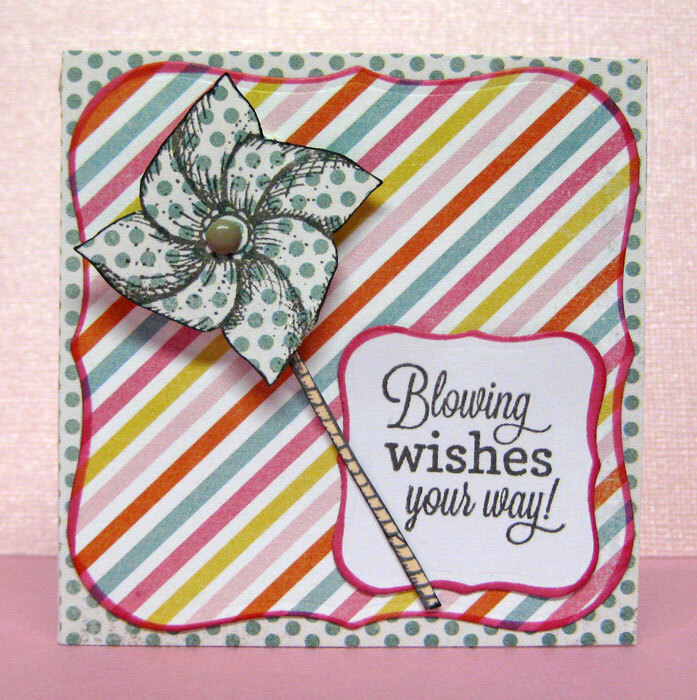 Flourishes Challenge FLLCBC1: Use black and white in your card for 6th birthday celebration. CAS-ual Friday: Count Me In-use number on your project. I was inspired by the BasicGrey pattern paper to make this card using only papers, piece of acetate, and one stamp. 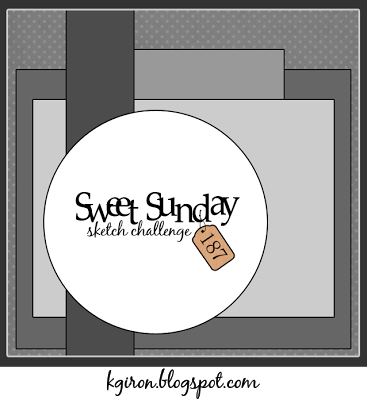 I began with a sketch from Crazy 4 Challenges and BasicGrey Sweet Threads. 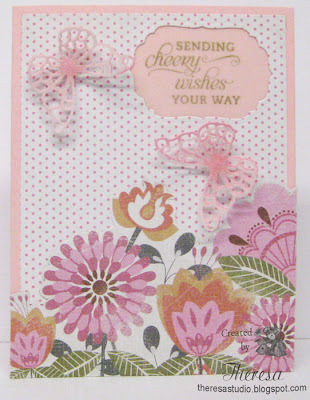 I placed a mat of the large floral pattern on a solid Pink card base. I used flowers from a Sweet Threads page kit and popped up the smaller flowers on green circles cut with a Nesties die and popped up the larger flower in the center. I used BasicGrey green brads in the centers of the flowers. 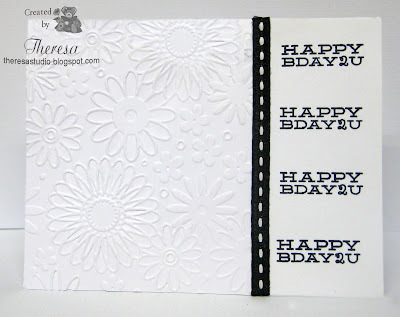 Since I did not want to hide the flowers with the sentiment, I stamped the GKD Happy Birthday on acetate with Black StazOn ink and used the brad to hold in place. 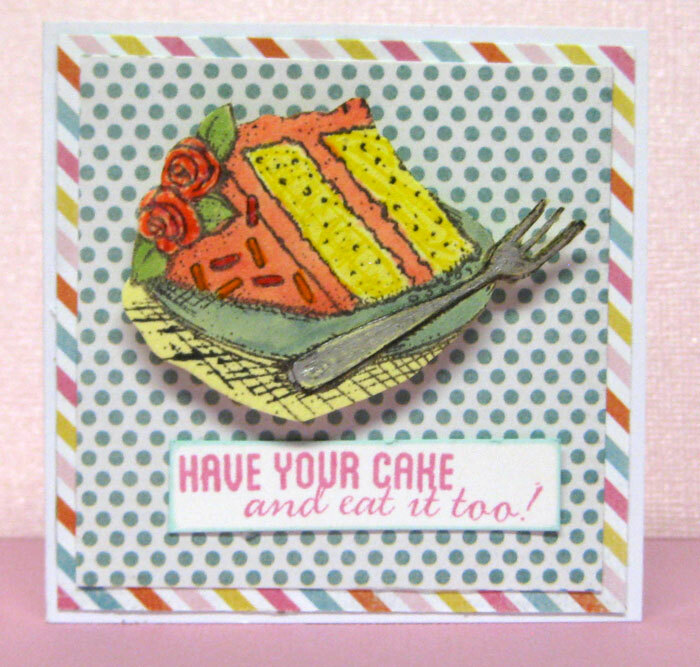 The challenge this week at Flourishes Timeless Tuesday is to create three miniature cards sized 3″ x 3″ or close to it… just smaller than your typical A2. The new set that I just won from Flourishes Pinwheels and Popsicles was perfect for making a trio of mini cards to use as tags for birthday gifts. I used pattern papers from a MME pad and white card stock to create. used pop up dots to attach. Each card is 3" by 3". I am showing a photo of each card so you can see the details. These were fun cards to make mixing up the pattern paper which was 2 sided. What fun sentiments in this set!! 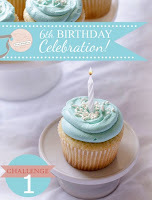 Flourishes is having a Birthday Celebration and they are having a challenge for us to celebrate. Create a little drama on your card by using the bold combo of black and white. For this Birthday Celebration Challenge, enter as many times as you like. We have until 11:59 PM CST on July 31st to enter! Winners will be announced Saturday, August 3rd and winners will receive a goody bag from Flourishes valued at $30! What a fun way to celebrate!! I made my card using one of the Flourishes stamp sets that I just won....I used stamps from Anemones that I stamped with GKD Black ink on white card stock. I did some embossing with Cuttlebug EF Wicker Weave border, added a Ribbon, and placed the image on a Black Mat and then on to a White card base. Hello! 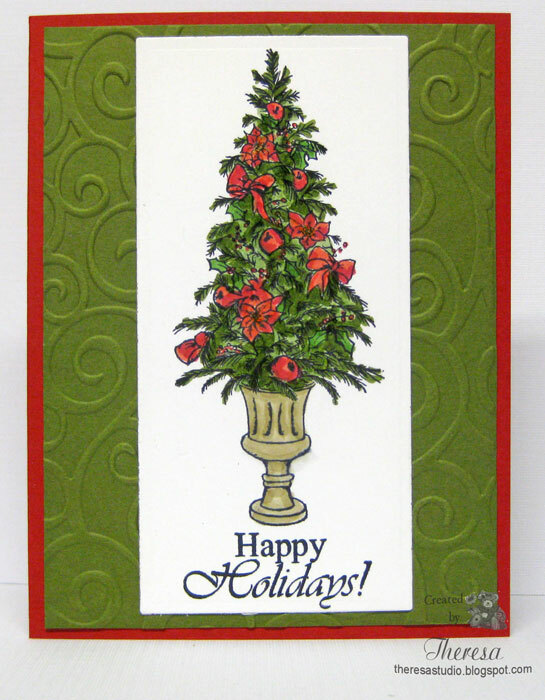 I am back to making Christmas cards ....this one is for Joan's Gardens Challenge.. We are to make a Christmas card, use the traditional red and green colors , have something from nature (used Flower) and use a product sold at Joan's Gardens. I made a poinsettia using the flower making tools and Cheery Lynn Build a Flower #1 Dies that I bought at Joan's. I started with a Red Card Base and used a beautiful border of Green Cardstock that I cut with Cheery Lynn Cathedral Lace Frame Die. I trimmed out the center of the frame to create the border for the card. 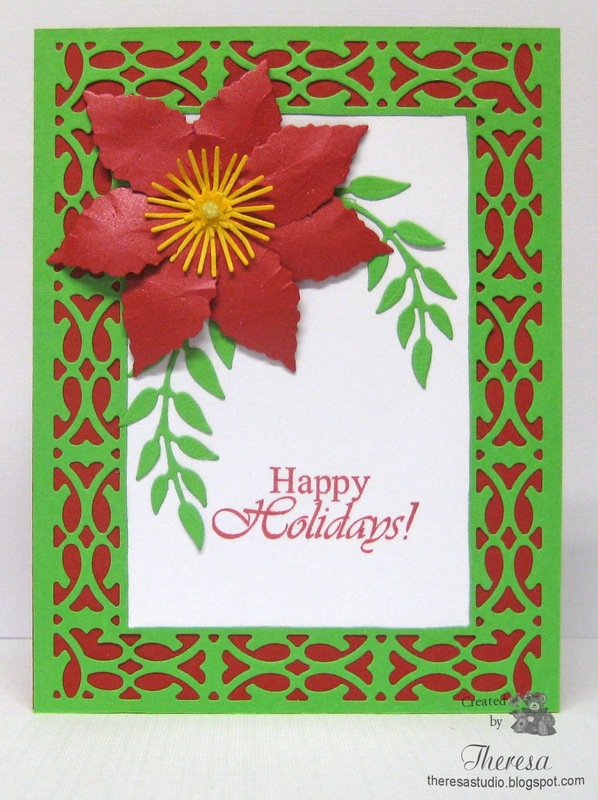 I placed a white rectangle inside the border and attached the poinsettia and branches cut with Cheery Lynn Olive Branches Die. I stamped a Christmas sentiment from Gina K Designs with Memento Love Letters ink. What could be better than a cold Popsicle on a 90+ degree day?? Well maybe 3 Popsicles! This card is for the current What If? Wednesday sketch #J1013 challenge at The House That Stamps Built. I used Popsicle and sentiment stamps from Repeat Impressions to create this "cool" card using paper piecing on the chocolate treats. I added some stickles for the vanilla ice cream. I used a embossed pink card stock to serve up the sweets. 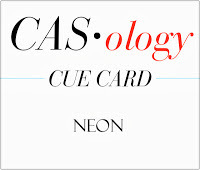 I had not planned to do more posts today but I realized that the challenge for NEON at CASology ends in just a few hours and I wanted to get my card in. 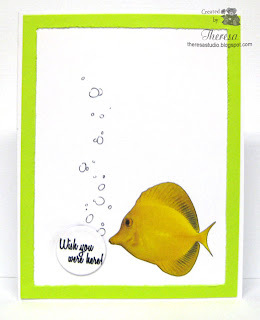 I used a digi of a Yellow Tang fish......I think he is a neonish color and I framed it with a Green Neon Cardstock from my stash that I distressed inside edge. I kept everything very CAS ...just added some water bubbles (Digi from Make It Crafty) and a stamped sentiment from Flourishes cut with a Nesties circle die. Another post for today! Been doing a lot of challenges since it is too hot to do much outside. 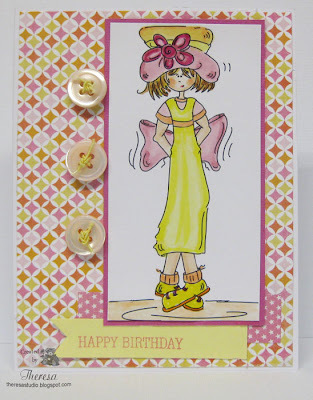 When I saw Sassy Cheryl's Digi Stamps Challenge "Hat's On", I immediately thought of one of her older digis that I think I got as a freebie when I began collecting Digital images. This girl was perfect with her big hat and I colored her in summer colors taken from the pattern paper from MME's Happy Day paper pack. I used a sketch shown below from Tuesday Morning Sketches ...they have 4 sketches to choose from this week celebrating their 4th birthday. Shopping Our Stash Challenge #109- use summer colors or summer theme. One Stop Craft Challenge: Summer Colours. I think my colors are very summery! Other supplies used: White, Pink, and Yellow Cardstock from stash. Copics R 20, 81, 85, RV 11, E 00, 000, 11, 34, 35, 37, Y06,11, 13, 26 ,28 , YR 02,07. Glaze pens in Orange, Yellow, Pink. Annabelle Stamps Sentiment. Memento Rose Bud ink. Pink Buttons and Twine from stash. Hope you are having a cool weekend? Hello! I have been resisting making Christmas cards this early but there are so many challenges to make Christmas cards that I finally gave in and made one. I pulled out 2 GKD stamps from my Christmas stash to create this. I stamped the tree from Very Merry Christmas set by Theresa and the sentiment from Festive Frame by Melanie with GKD Black Onyx ink. I was very pleased with her new ink which I had just received in an order...it is indeed the blackest black ink. and works great with Copics! I colored the image with Copics G 99, R 24, 46, Y28, YG 63 and cut out with Nesties Rectangle die. I hardly used the rectangle or square dies but this was a good fit. My papers used were also from GKD - White , Red Velvet, and Fresh Asparagus. I embossed the green mat with Cuttlebug EF Divine Swirls. 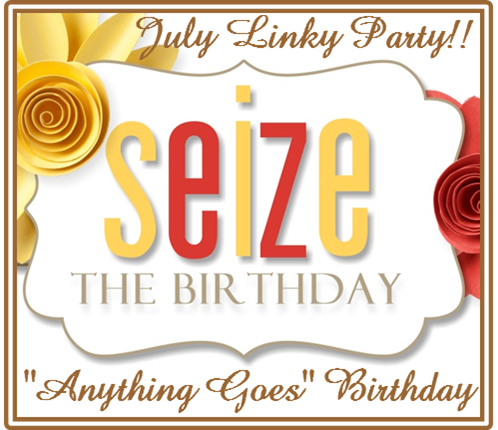 I kept this a simple design....no embellishments for easy mailing. Craftyhazelnut's Christmas: Challenge is Trees...use at least one. I have not been paid for endorsing any products in this post. All opinions are my own and have not been solicited. Welcome! This card was made using the Spotlight technique and a Digi from A Day for Daisies called Gathering Flowers. I printed the digi twice leaving one in black and white and cutting and coloring a circle from the other image for the spotlight. I used a pink cardstock from scraps and a pattern paper from GKD Berries and Vines paper pad as mats for the image. 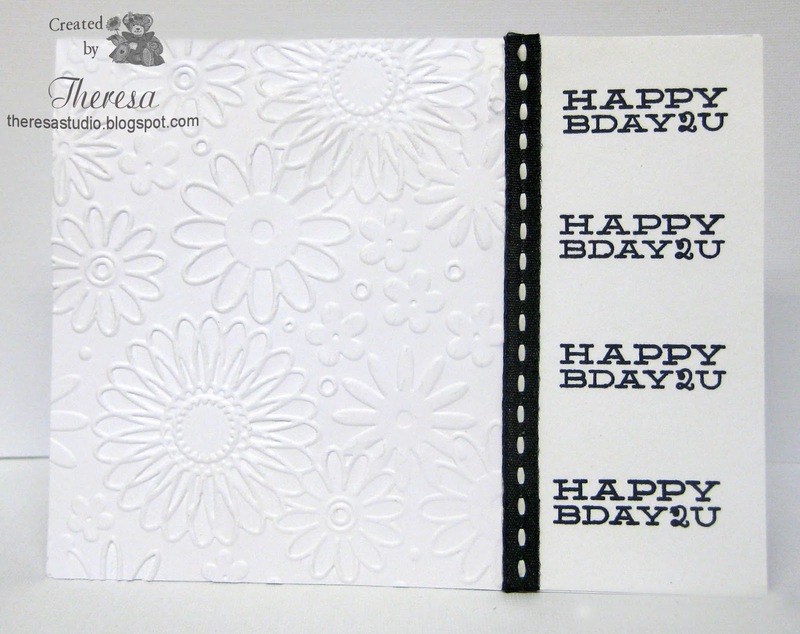 I embossed the pattern layer with Cuttlebug EF Polka Dots for texture. I finished with a White Cardstock Card base and a Pink Satin Ribbon with the sentiment from Annabelle Stamps Whimsey Flowers stamped in Memento Rose Bud ink. Copics and Markers used for coloring. Oldie But A Goodie: Theme is In the Garden - digi has been in my file way over 6 months ..used old ribbon from stash. 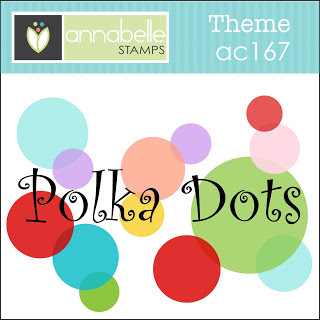 Annabelle Stamps: Use polka dots-Dots in paper and embossed also. The challenge at Flourishes Timeless Tuesday this week is “Seeing Clearly” - use Acetate anywhere in your project or card (FTTC228). I have not used acetate in card making many times but there are so many ways it can be used. I decided to make a very simple card using a pice of acetate 4.25" and 5.5". I attached some Pattern Paper (from Cloud 9 Travel Chitchat) to the top and bottom edges making the top piece of pattern folded to attach to the back of the inside layer. 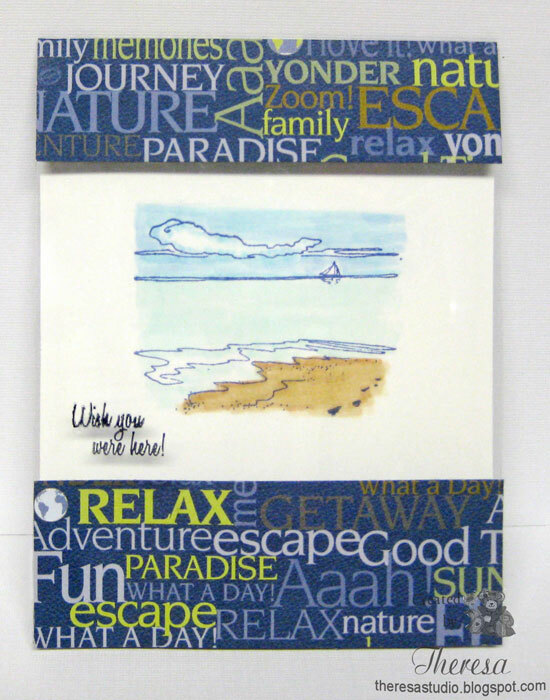 For the inside I stamped a scene and sentiment from Flourishes "Beach Life" on GKD white cardstock with Memento Inks Paris Dusk (Scene) and Peanut Brittle (Sentiment). I colored the image with Copics B 0000, 000 ,01, 13, 41, BG 000, 10, 11, E 30, 31, 33. This was then attached to top edge of the outer layer. I finished by stamping a sentiment to the acetate layer with Stazon Black Ink. Hello! 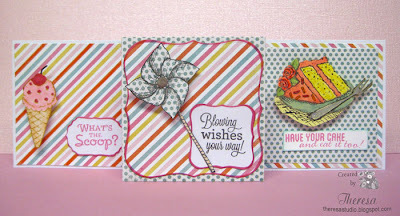 It has been a while since I entered a card for a challenge at Stamp TV but I just had to make time to enter the latest Release Party challenge for Gina K Designs at Stamp TV. 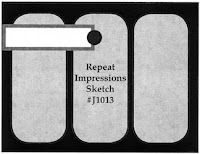 We are to stamp an image onto a favorite colored card stock and color the image on there. 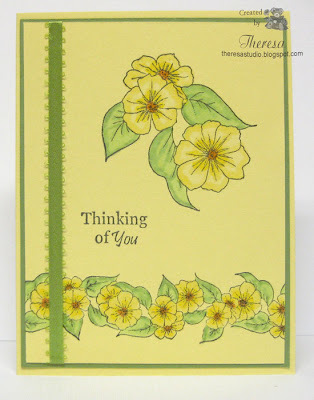 I selected GKD Lemon Drop cardstock for my creation and stamped flowers and sentiment from Melanie's Buds and Vases and a border from Melanie's A Year of Borders with Memento Tuxedo Black. I colored the images with Copics G 40, 82, Y06, 13, and YR12...love how this looks. I added a ribbon from stash to the image and placed this on a GKD Grass Green CS mat and then the base card of Lemon Drop CS. Finished the centers of the flower with a Clear Glaze pen for some texture. 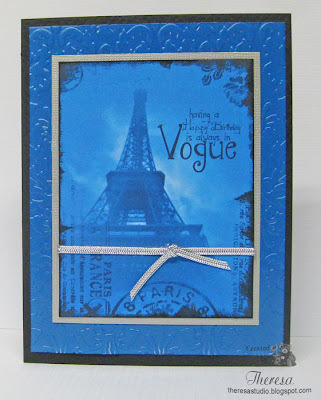 This card was simple to make with a freebie from Dana's Inspirations a photo of the Eiffel Tower with an overlay...it was originally in tones of brown and I converted it to blues with Photoshop Elements just because I wanted to. This photo brought back memories of a trip to Paris many years ago. After printing and trimming the photo, I added more black ink around the edge, wrapped it with a silver metallic ribbon, placed on a textured silver cardstock mat and then a glossy blue mat that I embossed with Cuttlebug EF Kassie's Brocade....very French looking. I used a textured black card base. I forgot to mention that I printed directly onto the photo a Birthday sentiment "having a Happy Birthday is always in Vogue" that I saved from Create with TLC. My husband especially liked this card! Our Creative Corner: Captured Memories-share a special memory captured in a photo...project must include a photograph . A vintage photo from the Internet is also acceptable. Papertake Weekly Challenge: Use something old, new, borrowed or blue. It can be just one of those things or any combination you want really. I used blue, old ribbon and papers, and I guess the photo could be considered borrowed. This week is the release of new stamps at Flourishes and that means a great new challenge to join in! It’s this fun sketch shown and you might win the entire month's release. I made my card using Tiger Lillies from A Year in Flowers. After stamping the image on White Cardstock with Memento Espresso Truffle ink, I colored the image with Copics Y17, 38, YR 02, 07, 21 and memento Markers Bamboo Leaves and Potter's Clay. I used GKD Grass Green CS as the card base with a mat of yellow and did a circle cutout and placed the Lily image underneath the window. The sentiment from Flourishes Zinnias was stamped on Grass Green Cardstock with Potter's Clay ink and enhanced with a cut out lily. I originally made my card as shown on the left but then decided it looked too sparse and stamped the lily stamp in Bamboo Leaves ink to fill in the background. Which card do you prefer? Thanks for stopping by. I appreciate all your comments. I love the Patriotic Bear from Meljens. He is a favorite of mine to use on My Hero Cards made for Operation Write home. 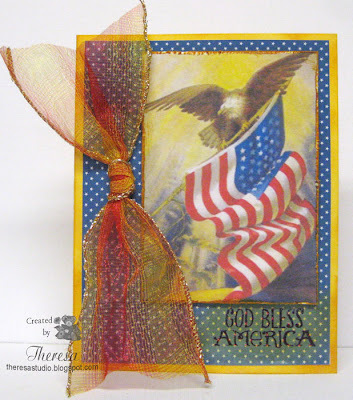 This one I made to enter in the Patriotism challenge at Meljens Designs. After printing the image on white cardstock, I colored it with Copics B 21, 24, 29, E 30, 31, 35, 36, Y 28, R 20, 24 and a Gold Glitter Jelli-ink pen. I added some shine with Clear Star Pen. I used SU Brilliant Blue CS for the base and mats and Doodle Pantry Stripe digi paper for the background which is embossed with Cuttlebug EF Divine Swirls. The sentiment from Verve was stamped with Versamark ink and heat embossed with Gold EP. Also entering into Simon Says Patriotic challenge which ends very soon....but why not! The second card that I have today is a bit different from my normal style and uses different colors and subjects from my usual. I was inspired to create this for the July challenge at Craft a Scene which is Under The Sea. Check out all the DT designs here for your inspiration. 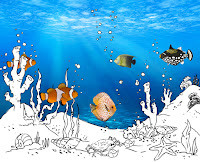 In a search online for other ideas, I came across some digital stamps at Make It Crafty called "Under the Sea Elements" and some fish clip art by Dixie Allen along with an image to use as a background. 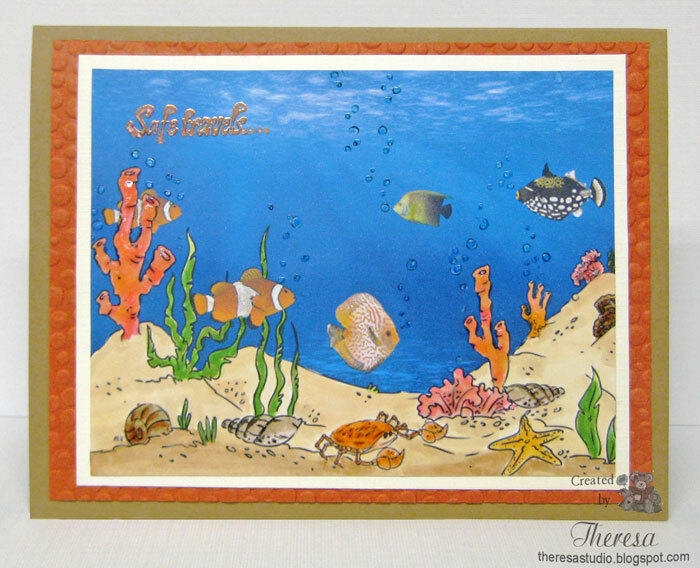 I created the card using Photoshop Elements by starting with the Sea image background called Ocean the Briny Deep and layering in the digi Seafloor with additional digis of a crab, a seashell, and bubbles. I then added in the Clown fish, Trigger fish, Discus, and Angel fish which were already colored. When I was satisfied with my scene I printed it on white cardstock and trimmed as needed. I colored with Copics E 39, 33, 43, 51, 53, 55, R20, 22, RV 14, 21, YG 03,09, 67, YR 02, 07, 14, 21. I added glossy accents to the shells, crab, coral, snail, and starfish but does not show up very well in the photo. I used a clear glaze pen to highlight the bubbles which you can see. 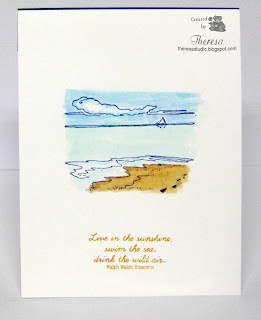 I stamped a sentiment from GKD Gifts of the Sea using versamark ink and Copper EP. I placed the scene on a mat of textured White Cardstock, then a mat of GKD Tomato Red CS and then the card base of GKD Tan Leather CS. I cannot believe I am entering this card for this challenge so early in the month....I am usually doing so at the very last minute. No Matter Which Way Challenge has their final challenge which is Anything Goes and using a sentiment as your stamp is permitted. 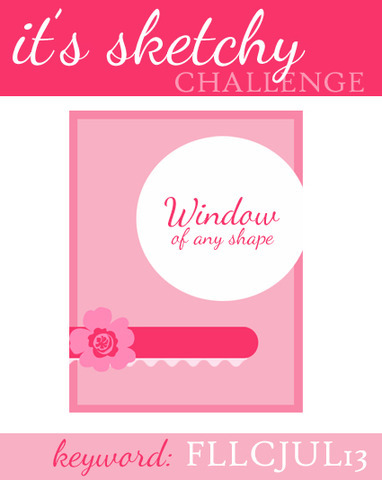 The Ribbon Girl Blog's Challenge is to simply Add a Bow. 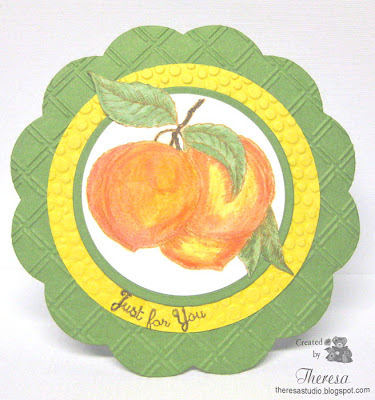 My card follows all the guidelines for Joan's Gardens challenge to use a plain background, a double oval, a sentiment, any color combination of at least 2, and must use a product sold at Joan's. It was hard to keep the background plain....wanted to emboss or something. 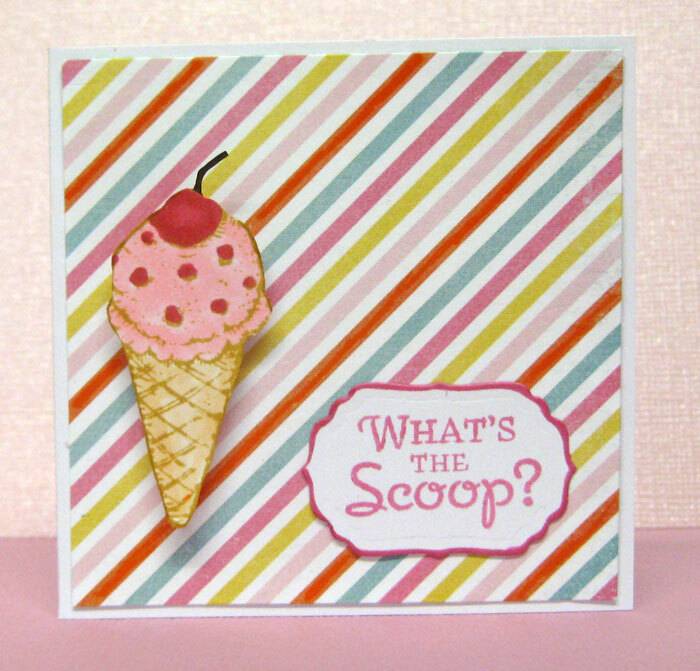 The challenge at Cheery Lynn Designs Blog is to follow the theme of IN STITCHES and use at least one Cheery Lynn Designs die. I did a faux stitching around the edge of the card with a green Gelly Roll pen. (hope faux is acceptable). I like my corner embellishments. For this card I used Cheery Lynn Swedish Spring Oval Frame Nesties classic oval dies. I also used Cheery Lynn Ambergris small doily die which I cut into 4 parts to use as my corner embellishments. My flower was made using Cheery Lynn Build a Flower #1 and #2. I used a flower making kit from Joan's. The Flower was made from scraps. The Cheery Lynn products can all be purchased at Joan's also. The card base is a White cardstock from stash and the Swedish Frame is cut from a shimmery iridescent white card stock which I hope shows in the photo. The lavender paper is from Joan's. 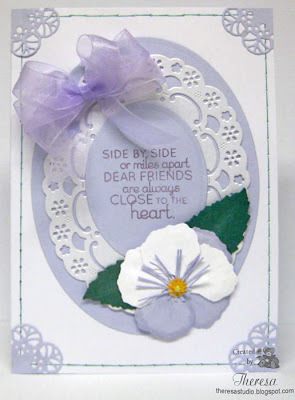 I stamped a sentiment from Flourishes Heart Lines in Memento Sweet Plum ink on the lavender oval and finished with a Lavender Bow of sheer organza ribbon. My second post today. 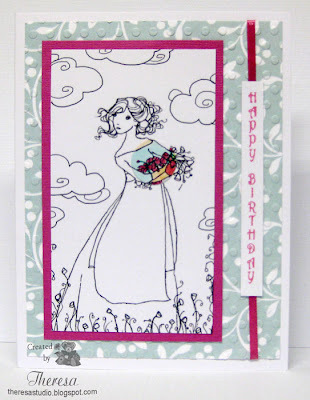 This card is for the challenge at Flourishes Timeless Tuesday to make a circle card. I have used a Flourishes Stamp from "Cherries and Peaches" stamped on GKD White cardstock and colored with Copics and Pencils. I cut the image with a Nesties Circle Die letting the leaves extend beyond the circle. I layered with circle mats of GKD Green Grass cardstock and Bazzill Grapefruit Bliss cardstock and then a card base of GKD Green Grass cardstock cut with Nesties Scallop Circle. 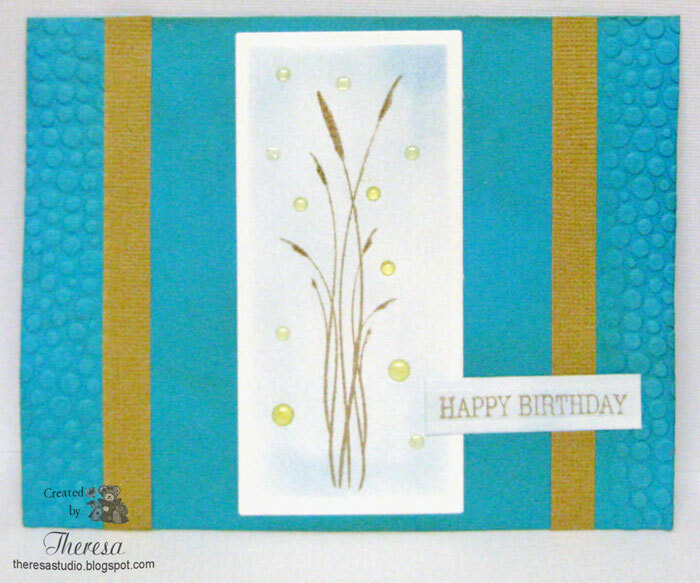 I added textures to the layer with Cuttlebug Wicker Weave and Tiny Bubbles embossing folders. Sentiment was from Flourishes Garden Fresh. Copics used were G 21, 82, Y02, 11, YG 63, YR 02, R22. Inks were Memento Peanut Brittle and Rich Cocoa. 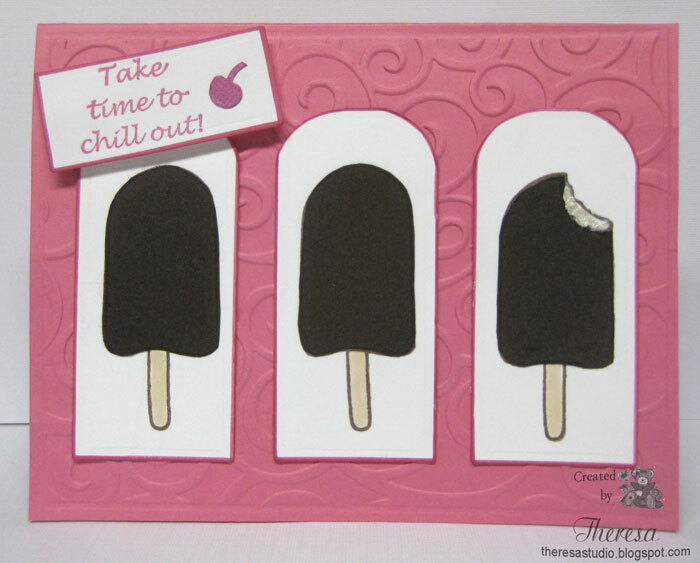 This card is a combination of 2 challenges...City Crafter Challenge "Cooling Down" to use the inspiration photo and colors shown to the left and Annabelle Stamps Sketch Challenge ac166. The Grass Stamp from Annabelle's "All Things Grow" was stamped in Memento Toffee Crunch ink on a white cardstock rectangle and sponged with Memento Summer Sky ink. I added some adhesive Rain Dots by Cloud 9 Design to give that wet look and some dimension. I used a turquoise card base that I embossed sides with Cuttlebug Tiny Bubbles EF and sponged with Antique Linen Distress Ink to darken a bit and give a wet look....does not show very well in photo. 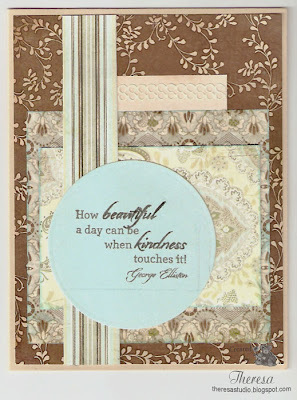 I finished with strips of textured carmel card stock and an Annabelle sentiment . 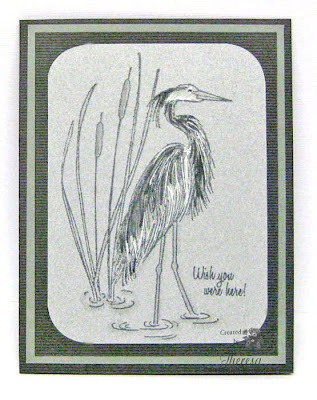 Today I am covering 2 challenges with this card....the Designer's Choice DCC73 at The House That Stamps Built to create a monochrome card and the Less Is More Challenge to create a CAS card in Shades of Gray. I am hoping the card has enough "Gray" space to qualify as CAS! 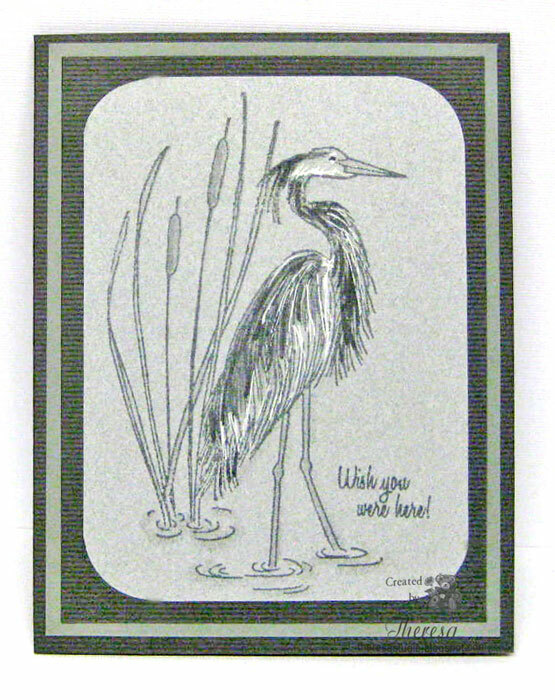 I stamped Repeat Impressions Great Blue Heron with Memento Gray Flannel ink on a mottled gray cardstock and added some shading with Copics N 0, 2, 4,7 and some highlights with a White Gel pen. I trimmed the corners with EK Success corner punch. I assembled the card base of dark gray, a mat of lighter gray and another mat of the darker gray under the image. All papers from stash. The sentiment used is from Flourishes. 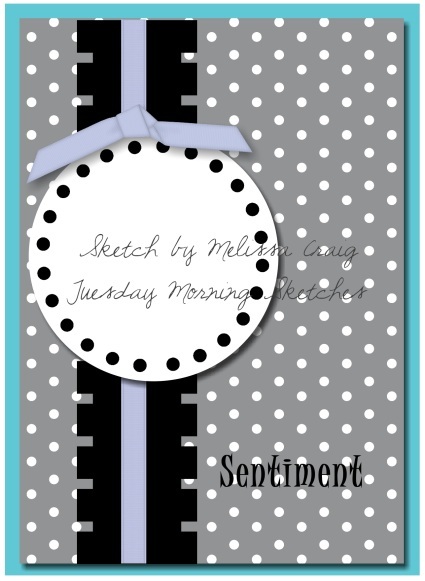 This was an easy peasy card...clean lines, minimal elements, areas of grey space and no embellishments. Today I made a card with my favorite color combo Pink and Green and also used a favorite technique of coloring with Copics. 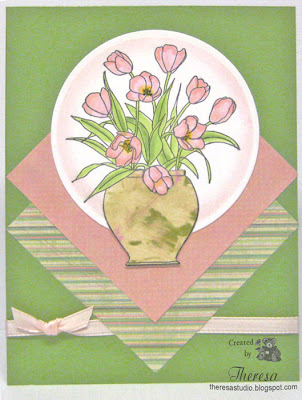 I love making cards with a flower theme and this is made with a favorite flower - Tulips. I am using a sketch shown below from the challenge What If? Wednesday from The House That Stamps Built. The stamp is Repeat Impressions "Vase of Tulips" that I stamped with Memento Tuxedo Black ink on GKD White Cardstock. I colored with Copics and cut with a Nesties Circle die with the vase hanging outside the circle and sponged with Distress Ink Spun Sugar before removing from the die. I paper pieced the vase with a scrap from a paper that I made using the shaving cream technique. Using scraps of pattern paper, I assembled the elements on a card base of GKD Grass Green Cardstock. I used Nesties Square dies to cut the pattern papers. I embellished with a Pink Satin Ribbon. What a fun sketch and a great stamp! The challenge at Sassy Cheryl this week is Red, White, & Blue with a Sassy Cheryl image, of course! I have been wanting to use the Patience Secret Girl digi and thought she'd be perfect in RWB with this digi paper from Doodle Pantry. I used a GKD Red Cardstock as the base, layered with a GKD Navy mat topped with the pattern paper. After coloring the image with copics, I added to a navy mat and attached with foam strips to pop it out a bit. Finished with a red star brad. I had to write in the sentiment that I wanted to use with a red pen.....I had a clear stamp to use but I lost it on my work desk , not once but twice. No telling when it will turn up again and I did not have "patience" enough like Sassy to wait until I find it. Sassy Cheryl's Digi Stamps Challenge: Red, White, & Blue with a Sassy Cheryl image. The ABC Challenge: Q is for Quite a Few...used 5 layers. Another card for today. I made this combining the challenge for Sweet Sunday sketch #187 and Basic Grey Challenge to use no stamped images with Basic Grey products. 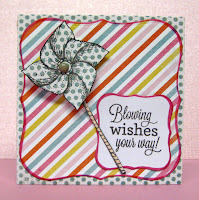 I used Basic Grey Cappella Paper pack to create the design on a card base from stash. 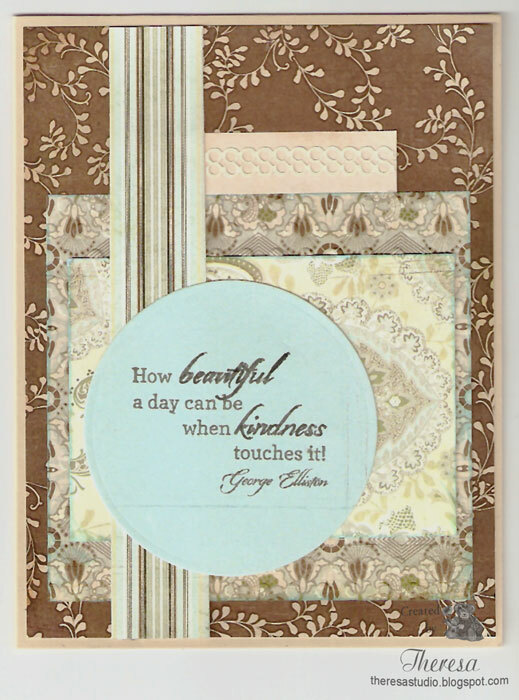 I stamped a sentiment from Flourishes on a circle of Designer paper with Memento Espresso Truffle ink. I added some paper lace from K& Co. 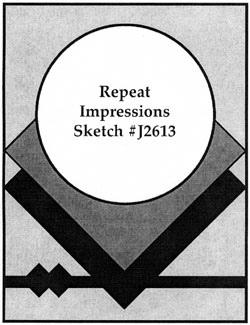 I like the play of all the designer papers together in this sketch. Added some highlights to the edges of some of the layers with a Blue Distress Ink. 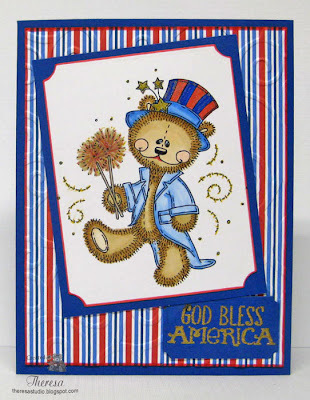 This is a second post today and another card to celebrate the 4th of July! 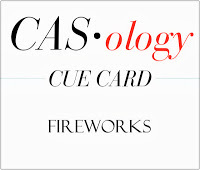 I made this CAS card by using a Fireworks stamp from Repeat Impressions and a sentiment from Verve's American Hero stamp set. 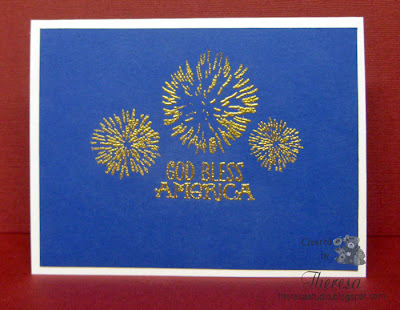 I stamped both using Versamark ink and Heat Embossed with Gold Embossing Powder on SU Brilliant Bue Cardstock. I attached to a base card of GKD White Cardstock. How simple and sparkly can that be. I hope your July 4 was a great day. I spent part of the day making cards including some patriotic cards. This is one that I made for Sugar Creek Hollow vintage challenge to make a vintage or shabby chic card using only the colors of the flag of your country. I may have included more than the Red, White, and Blue of the flag but liked this graphic for my card. 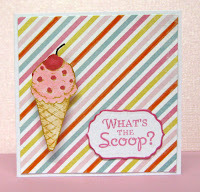 The graphic that I used is from Magic Moonlight Studio and is matted on a digi star paper from Doodle Pantry. 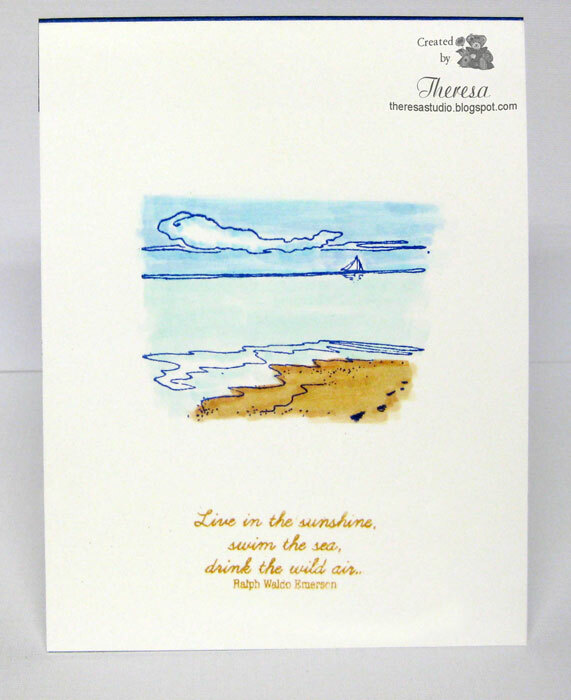 My base card is a gold cardstock from stash that I distressed with Wild Honey Distress Ink. 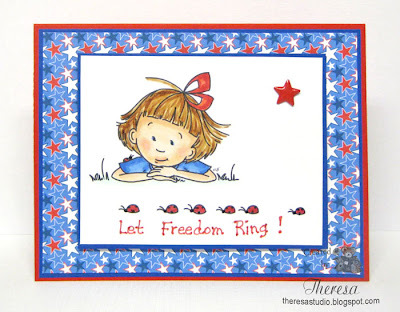 The sentiment is from Verve's American Hero stamp set. It was stamped in Versamark ink and heat embossed with Red EP. Added a twist of gold wired Ombre ribbon to finish. When I saw the month long challenge at Craft a Scene, I knew exactly what I wanted to do for my entry, but since I have not been in my my studio much the last few weeks, I am running late completing my card. The challenge is to use Realistic Forest Animals in a scene. 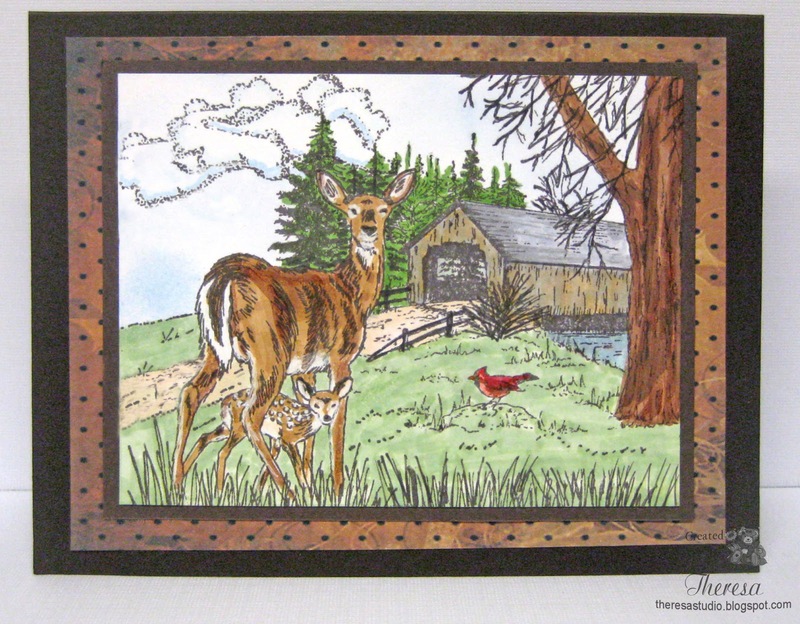 I stamped the White-Tail Doe and Fawn using a stamp from Repeat Impressions using Memento Espresso Truffle ink on white Cardstock. I masked the image and stamped a covered bridge in the background with a Heartfelt Creations stamp and stamped clouds with another Repeat Impressions Stamp. I colored the image with Copics and Sponged the Sky with Memento Summer Sky ink. Added more grass across the bottom edge with a marker. I trimmed the image and attached to a brown mat and then to a dotted digi paper scrap leftover. This was placed on a my card base of Dark Brown. This was a fun card to do. Hello! 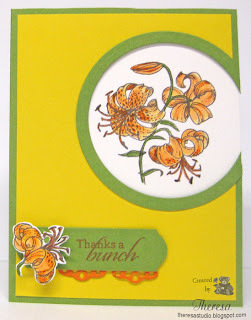 I am posting this card that I made for Joan's Garden Challenge. We are to use polka dots , some vellum, butterflies , any color combination , and use a product sold at Joan's Gardens. The pink cardstock for the base card is from a pack of Pastel Fashion colors purchased from Joan's Gardens. 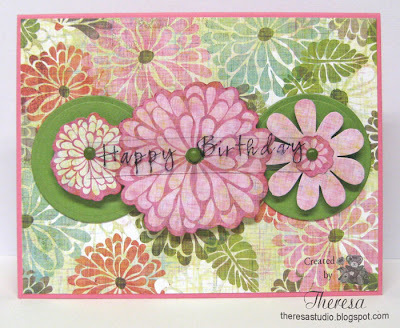 I layered this with a mat of polka dot paper from MME's 6x6 Paper Pad and then topped it with part of a floral paper from MME's Indie Chic Paper Pad that I fussy cut . I stamped the Sentiment (Spring Has Sprung set) by Flourishes with SU Always Artichoke ink on a scrap of Velum and attached it under the polka dot layer in a window cut with Nesties Label 4 Die. I then attached with foam dots the 2 butterflies that are a double layer of pink cardstock and Velum. The butterflies were cut with a Memory Box Pippi Butterfly Die that I won from Joan's. It is fun how easily a card can be built with 3 papers, some scraps, and a couple of dies....and of course a stamp and ink. Hello! There are so many challenges for using Red, White and Blue this week! I made this card using some items from Doodle Pantry including a Star Digi and Digi Paper. I printed the Digi from the Doodle Pantry US Star set already colored and added some gold ink to the stars in the center and cut out with a circle die. I layered this with pop up dots on to a Lacey Circle cut in textured Red Card Stock. 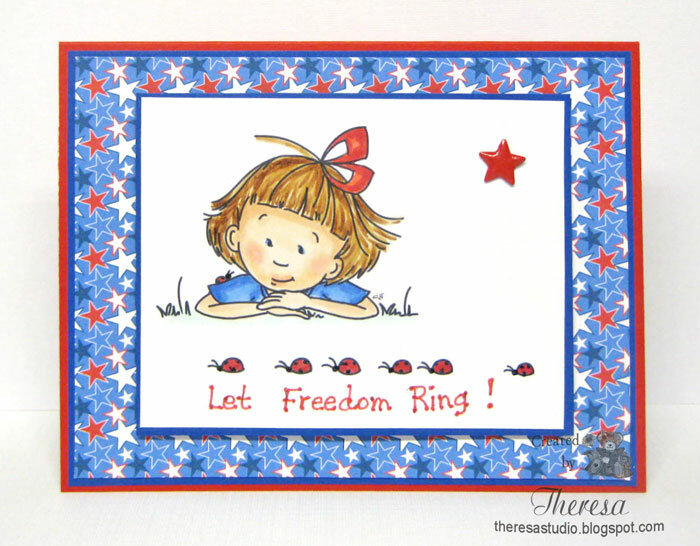 I used a SU Brilliant Blue Card Base and used a mat of Doodle Pantry Stripes and Stars Digi Paper. 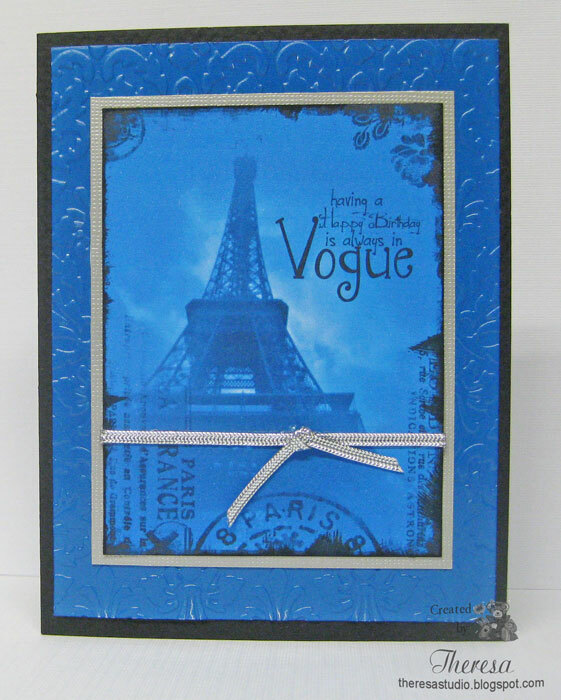 I added a strip of blue cardstock cut with MS Double Loop Punch and layered with White Satin Ribbon. Assembled the card following a sketch from Tuesday Morning Sketches. Attached another piece of ribbon to the star and layered ribbon. Finished with a Sentiment from Annabelle Stamps stamped in Memento Paris Dusk ink. Ribbon Carousel: Celebrate your Heritage, show your country pride and celebrations.